This recipe came about a few years ago when I was looking for a quick and easy Dhal Curry to make over a long weekend. It’s a synthesis of a few other recipes I had on hand at the time and in my opinion, has the best of each. I do recommend you try it – don’t be daunted by the number of ingredients because many of them are straight from the spice box or pound together in one go. It also doesn’t take long at all – as long as you soak the lentils overnight, you’ll entire dish ready in around an hour and a half – including preparation time. – Me pounding the fresh spices. Pounding always brings out the best in spices. I feel it is such a waste to just slice the ginger and garlic only, which most recipes call for. The worst recipe I’ve seen asked you to peel the garlic only and just add it in to boil. Let’s face it – there really aren’t that many ingredients in Dhal Curry that add natural sweetness – the onion… tomatoes and possibly the garlic. So why take away what little sweetness this dish has left? 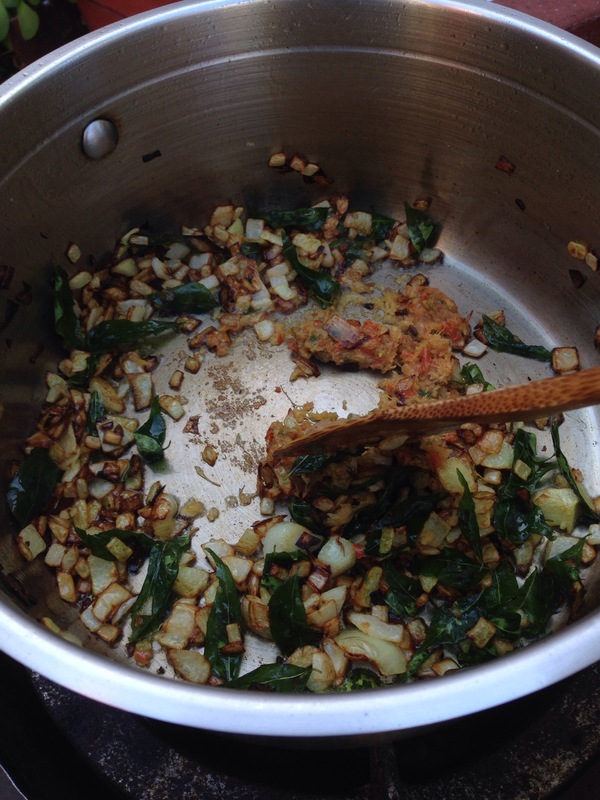 If you don’t want to make a dull Dhal (I always wanted to say that) – you really need to pound your spices. The destructive force of pounding stone on stone – crushing and splitting open the ingredients – unlocks their maximum flavour potential. On top of that, pounding is also quite relaxing too – you will reach a point where you get an almost meditational rhythm going – and by that time you are probably done as well! Relaxing and productive. Can’t beat that! – Using sugar and vinegar to enhance the flavour. If you think about it, aside from the tomatoes and possibly the onion, there really isn’t much in terms of umami in this dish. Although you do add quite a bit of salt, it only enhances the saltiness – if you know what I mean. To compensate for the lack of sweetness, I add sugar. I know sugar is a different kind of sweet – but somehow it help to make the natural sweetness of the ingredients more pronounced. I always add the sugar and vinegar in increments, tasting as I go until I reach the perfect balance that I am happy with. – 375 grams of red lentils, washed and soaked overnight with a tablespoon of garam masala mixed in well. – 4 medium red chillies. – 2 tablespoons of coriander powder. – 1 1/2 tablespoons of cumin powder. – 1 heaped tablespoon of red paprika powder. – 1 heaped teaspoon of hot chilli powder. 2 heaped tablespoons of Garam Masala. – 1 large brown onion, finely diced. – Thumb size piece of ginger cut into small pieces. – 5-6 large cloves of garlic, halved. – 3 springs of Indian curry leaves – washed, dried and leaves stripped from the stems. – 1/4 cup of oil. – 1.5 – 2.0 mililitres of water. – 3 large tomatoes, diced or a tin of canned tomatoes, juice and all. – white vinegar to taste. 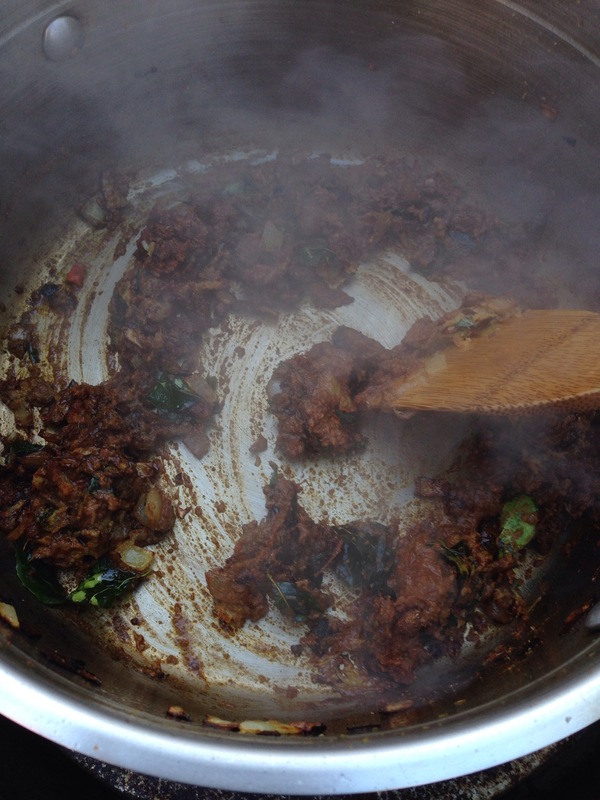 – Wash the lentils until the water comes out quite clean. I don’t think it will ever be ‘crystal clear’. Soak the washed lentils in one litre of water for a few hours – overnight is best. I always stir in a heaped tablespoon of garam masala to soak as well. Don’t ask why – I don’t really know! Creature of habit I suppose? 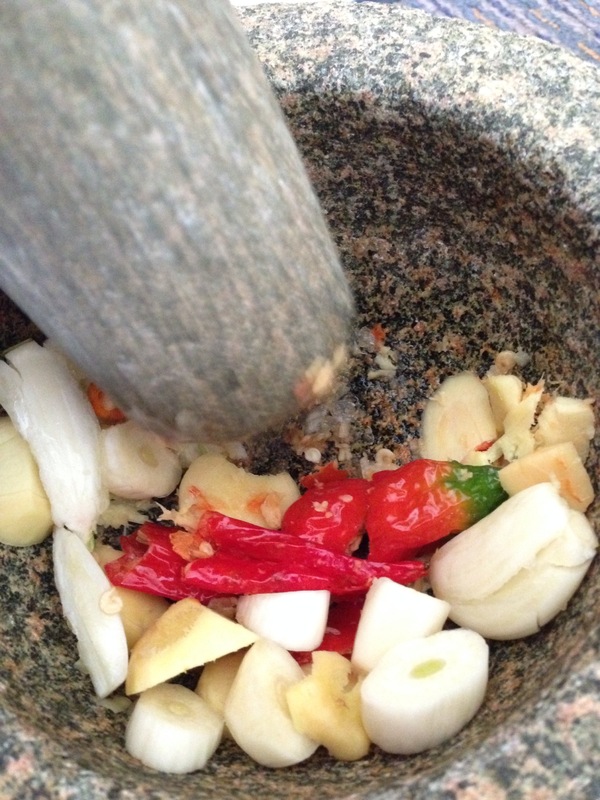 – Next, add all the fresh spices (chilli, ginger & garlic) to a mortar and pound away. I always cut them up to smaller pieces to speed up the pounding process. I don’t pound the onion because it is simply too watery and gets very messy. 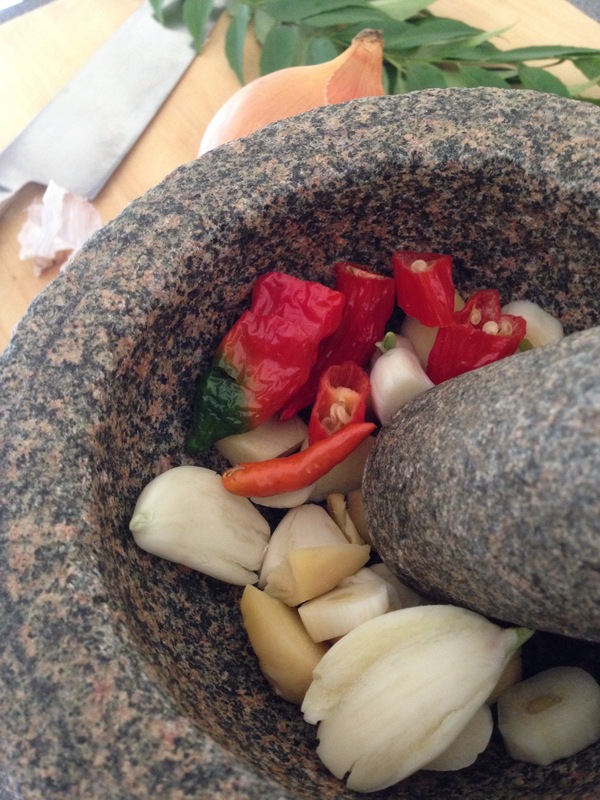 – In the beginning when the spices are still whole, the pounding process might seem a bit slow. – Once you break down each piece more and more, it becomes easier to pound and you start to get a rhythm going as you smash these spices to smithereens. – Very soon, after that meditational, rhythmic pounding, you are rewarded with a heavenly scented, aromatic paste. Remove from the mortar and decant into a bowl. 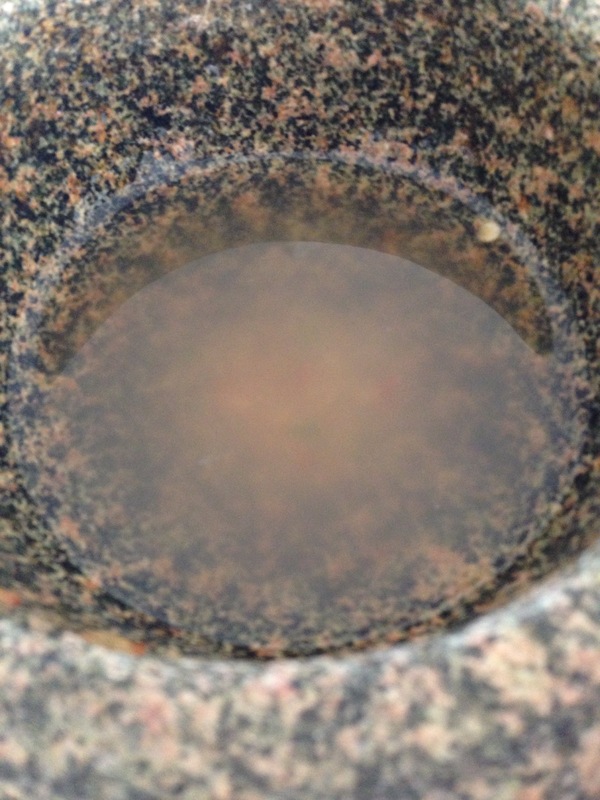 – Add a cup of water to the mortar and swish it around to loosen any embedded bits of spice. DO NOT throw out this water. Smell it – and you will know why. Use this fragrant water later when boiling the lentils in water. – Now you can start the actual cooking. Add the oil to a hot, heavy based pot that is wide enough so you can stir easily. When the oil starts to shimmer and the slightest wisp of smoke shoots up out of the hot oil surface, it is ready for the onions. Add the chopped onions and stir until they start to colour. – Next, add the curry leaves and fry them until they become translucent. Be warned though – they will pop and splatter as they sizzle in the hot oil. – Next, add the spice paste and stir it around for a few good seconds (at least 20 – I say) or until they release their beautiful aroma. Then, add the dry spices and stir through until mostly incorporated. Be careful because you don’t want them to burn. – When the dry spices have been incorporated, add the diced tomatoes. In this case I used them straight from the tin because we didn’t have any fresh ones at the time. 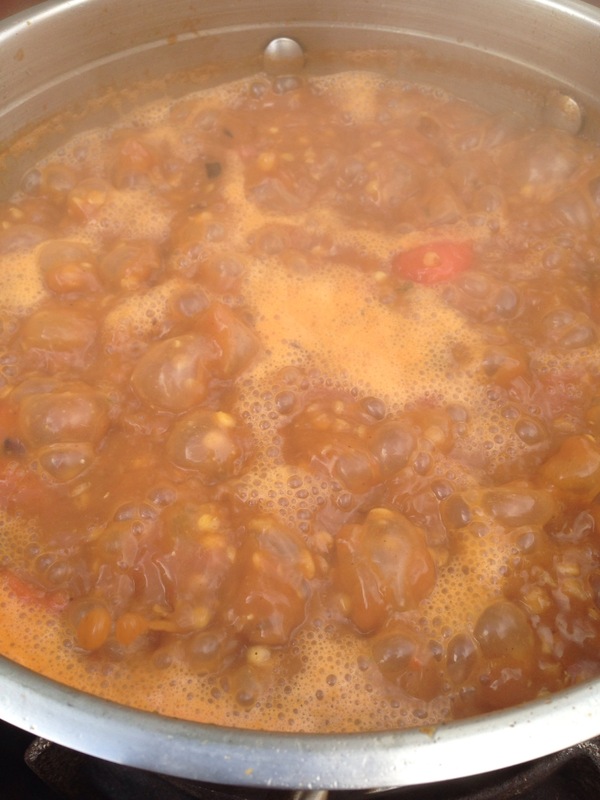 – Stir the tomatoes evenly through and add the soaked lentils, soaking water as well as the water you added to the mortar. At this point there should be enough water in the pot to cover the lentils to the point you can’t see them past the surface. If that isn’t the case then add more water until they disappear below the turbid, spicey, ‘stock’. 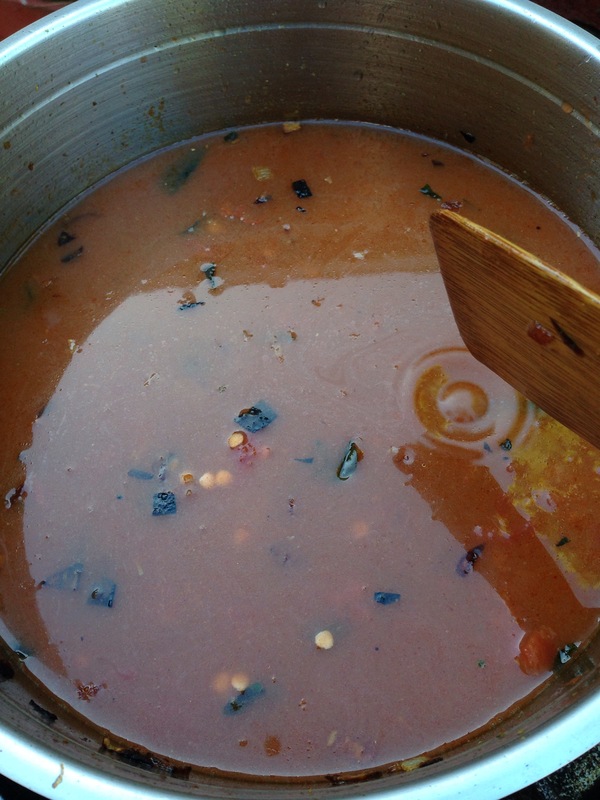 Don’t be scared by the fact that there is a lot of water – most of it will evaporate or be soaked up by the lentils. Bring the curry to a rapid boil with the lid ajar to allow steam to escape. Stir the bottom every now and then to prevent sticking. – After boiling for about 45 minutes to an hour you will end up with a nice, thick unctuous Dhal Curry. At this point you need to add your salt, sugar and vinegar.I always add the salt first – enough to the point where I am content with it’s saltiness. Then only will I add sugar – repeat the tasting approval process – and finally do so with the vinegar. It’s now ready to eat! I had mine with microwaved papadums.